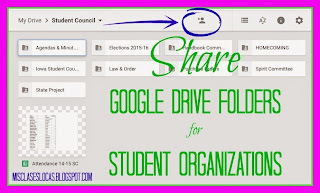 Something that worked really well this year for both Spanish Club and Student Council, was having a shared Google Drive folders for the group. If you have not jumped on the Google bus, you are missing out! 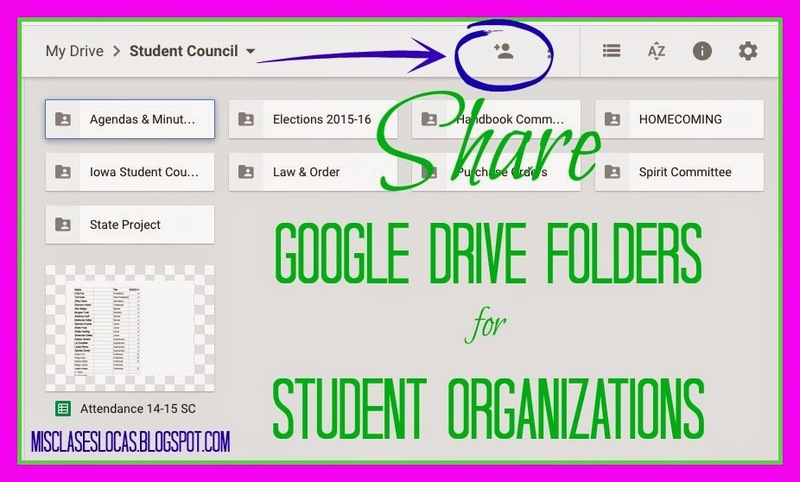 All of our students already have a Google account, so it is very easy to just share the folder by clicking the circled button below. This way all members are on the same page and the group can be paperless. For student council we had shared folders for agenda, minutes, elections, homecoming, etc. 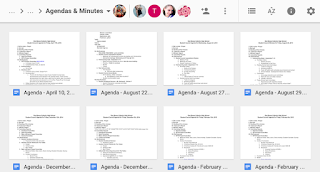 During a meeting, we project the agenda for the day, so there is no need for paper copies. If someone is absent, they can also access what was discussed. What is great is you can also change sharing permissions within a folder if there is something that is just for officers or advisor. For example the attendance Google sheet is only editable by the officers and advisor. 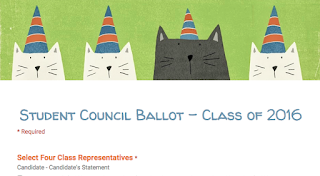 Another tip is this year we did student council election through Google Forms. 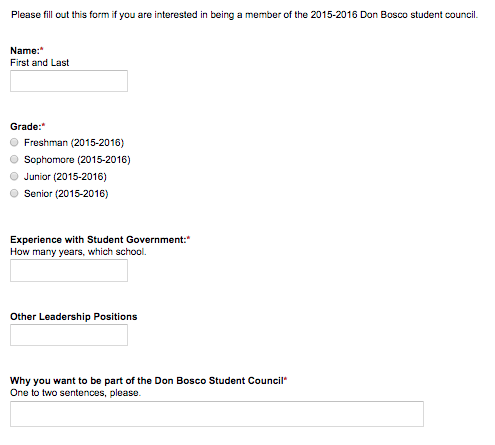 The membership application below was sent to the entire student body. 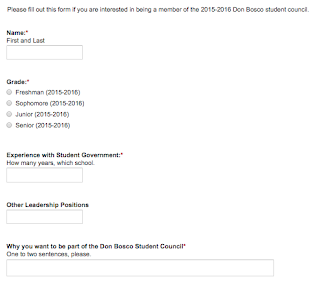 These applications were then put together in a Google Form ballot below for class voting. This also allowed us to include the candidates statement as to why they should hold the position. 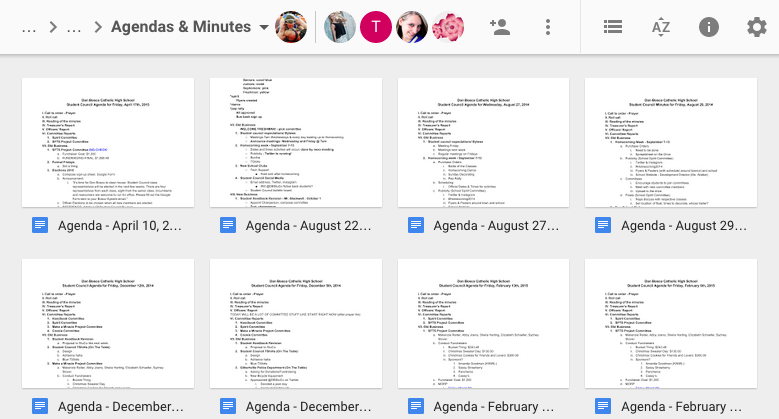 What are other uses you have for Google Drive? Inside: Reflections on taking the AAPPL test in Spanish class for the first time in an attempt to get the seal of biliteracy. © Mis Clases Locas. Blog Design by RachBV Design. Template by Georgia Lou Studios. All rights reserved.